We had his 7th birthday party this past weekend at our house- 2 parents to 12 boys (ages 5-8) - it was an intense 2 hours. Their energy was unbelievable - it's a wonder the only "injury" was one bloody nose! And this was not even all the boys in his class - imagine a class full!! I am still in a state of shock from the party - I don't think I'll ever forget it!! 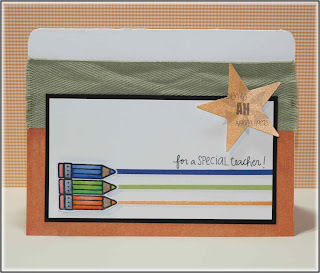 Cool card... love your little coloured pencils, just perfect for a teacher card!